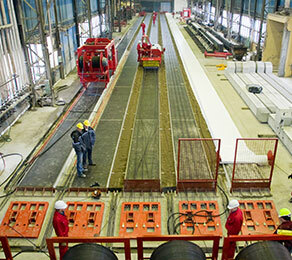 The market for precast production in Poland was boosted when, along with partners in Ukraine, the country won the race to co-host UEFA Euro 2012. CCL supplied prestressing equipment and grips along with partner company Spiroll Precast Services Ltd. Spiroll and CCL have a long-established reputation in Eastern Europe, so when Kon-Bet, one of Poland’s leading construction companies, was looking to establish its own hollowcore production, it contacted CCL and Spiroll to provide a solution. Spiroll provided a total project management package, covering everything from factory design and costing through to drawings for the local manufacture of casting beds. They also supplied all of the production machinery and accessories, as well as the commissioning and training. The turnkey project involved a total transformation of Kon-Bet’s existing precast factory. The equipment was installed by Spiroll and included its latest Universal Extruder, which produces hollowcore slabs at sizes from 150 mm through to 320 mm deep, using the same universal power unit. Spiroll also supplied all the necessary production accessories, including hollowcore design/production software; a concrete distribution skip; a multi-angle saw; a bed cleaner; lifting/fixing clamps; stressing abutments; and CCL stressing equipment, such as jacks and pumps. But the Spiroll involvement didn’t stop at the commissioning of the new factory. As part of the company’s support programme, Managing Director Stephen Carr returned to Konin, Poland to help Kon-Bet launch its new capability at a weekend seminar attended by 130 leading Polish architects.